20 x 27 cm., XLIII + 865-1136 pp. Adrados, F.R. 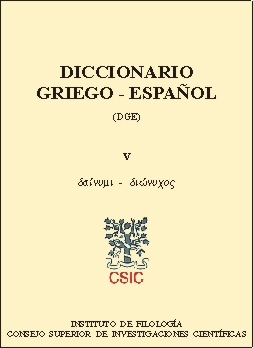 - Rodríguez Somolinos, J., «Diccionario Griego-Español, vol. V», Museum Criticum 30-31, 1995-96, pp.301-317. Alexandre, M., Euphrosyne 26, 1998, pp 519 s.; Black, D.A., Religious Studies Review 24, 1998, p.418; Führer, R., Kratylos 45, 2000, pp.207-210; Irigoin, J., REG 111, 1998, p.338 s.; Mawet, F., AC 69, 2000, p.386. ; Muñoz, F.V., Review of Biblical Literature 2000; Nachtergael, G., Chron. d'Ég. 73, 1998, pp.377-378; Poethke, G., AfP 46, 2000, p.156; Pugliese Carratelli, G., PP 58, 2003, p.250 s.; Schwabl, H., WS 112, 1999, p.230 s.; Trapp, E., JÖB 49, 1999, p.327-329.